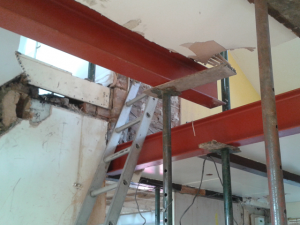 As part of our structural design service We can prepare structural calculations for steel beams, wall/chimney breast removals, foundations, retaining walls, etc. These can be either to our own designs or to plans prepared by others. We can also prepare sketches to accompany the structural calculations where the works are being carried out without the benefit of full plans, i.e., works being carried out under a Building Notice. These calculations are required for all structural elements that are not governed by empirical provisions contained within the Building Regulations Approved Documents, to prove their stability and suitability for use in any given instance. Working with Taylor Tuxford Associates was easy; their knowledge and advice not only saves money but instills trust that is needed when planning for large projects. The service goes further than just providing the calculations as their knowledge of local trusted suppliers and assistance with the building notification was also well received. Thank you for the great service, help and advice.